The trend of Indian cities hosting car free days, when streets or stretches are closed to motorised vehicles and opened up for the people and various events, has become quite pronounced. But can these really go beyond day-long enjoyment and festivities, and pave the way for more sustainable mobility? According to organisers, open street events have helped change mindsets and do bring about tangible outcomes. A survey by WRI (World Resources Institute) of 185 participants of Gurgaon Raahgiri Day showed that 28% had bought cycles after attending the event, and 87% had started walking or cycling for short trips. Similarly, a survey of 551 participants in Pathotsav in Bhubaneswar showed that 10% had bought cycles after the event. Of the 63 local businesses surveyed in Gurgaon, 79% favoured the event, although about the same percentage of traders had been skeptical before the event was started. Amit Bhatt, Strategy Head – Integrated Urban Transport at WRI points to the fact that several cities like Bhubaneswar, Bhopal, Indore and Karnal are building cycling infrastructure or making their cities NMT-friendly. This year, both Bhopal and Mysore have launched bicycle-sharing projects. Trustee of Raahgiri Foundation and Manager – Cities and Transport at WRI, Sarika Bhatt says that the Institute had already been working with these cities, but that open street days helped change the mindset of citizens and city governments towards accepting such projects. 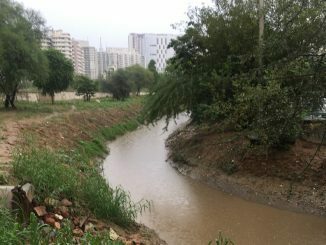 “Earlier, the idea of cycle lanes would not have been considered at all in Gurgaon, but now they are open to it,” she says. The smart city proposals of Bhubaneswar and Bhopal, which are among the top ones selected by the central government, got public approval during open street events, adds Sarika. “We had kiosks where the public could give their opinion on sustainable transport projects in the proposal; the visitors gave positive feedback. During the centre’s evaluation, cities got points for such citizen engagement as well,” she says. In Bengaluru, Cycle Days have created a model in which communities themselves drive change, says Sathya Sankaran of BCOS (Bangalore Coalition for Open Streets). While BCOS had initiated Cycle Days way back in 2013, now local RWAs or NGOs in different neighbourhoods organise the event themselves. Four neighbourhoods, in particular, are actively involved and are developing NMT (non-motorised transport) infrastructure. One of these is Sanjay Nagar, which now has 200 cycle stands in 40 locations, a proposal for 15 kms of cycle-friendly streets, and a Walkability Project. The Walkability Project on the 3.2 km long Sanjay Nagar Main Road, costing Rs 6-8 crore, would improve footpaths, create parking areas and vending zones. “Currently the road has varying widths, which results in bottlenecks and causes congestion. 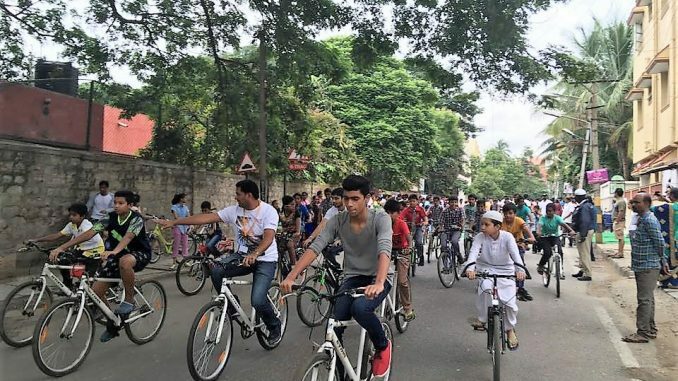 The idea is to have a uniform carriageway of 7.5 m, and to use the additional road space on the side as parking areas,” says Lalitha of CiFoS (Citizens for Sustainability), the Sanjay Nagar NGO that organises Cycle Day. However some residents oppose the project, believing that it would be disadvantageous to vehicle owners. Started three months back with funding from the Bangalore city corporation and DULT (Department of Urban Land Transport), the project has been stopped temporarily due to protests. But Lalitha expects it to be completed in the next eight months. “This is a neighbourhood of 60,000 residents, so there will be some opposition,” she says. Meanwhile, Yelahanka neighbourhood in Bangalore has also built cycle tracks around three lakes. HSR Layout now has cycle stands, and has the car rental company Zoomcar starting a cycle sharing initiative with 500 bicycles. Malleswaram has proposed a ‘Malleswaram Accessibility Plan’. “More neighbourhoods are taking such initiatives, and we provide support,” says Sankaran. At the government level such proposals are supported by DULT, which is part of BCOS. 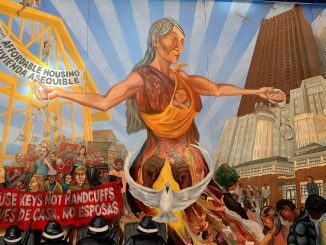 However, not everyone is convinced that open street movements can have a lasting impact. In Mumbai, not much has changed despite the ‘Equal Streets’ events, feels Nayana Kathpalia, Trustee of the non-profit NAGAR that works on civic issues in Mumbai. “Mumbai corporation has continued to build flyovers and badly designed skywalks instead of good footpaths or public transport. Pavements are still broken in most places, and occupied by hawkers and bus stops,” she says. Open street events have also faced opposition at times, especially when held in residential areas. In Bandra, the Equal Streets event was held for six months in 2014-15, but residents felt so inconvenienced that they got the corporation to stop the event here for good. Similar concerns were raised in Bengaluru, when recently the entire HSR Layout neighbourhood was made vehicle-free from 6 am to 9 pm for a day. “There were no parking arrangements for those visiting the layout. The event in fact caused a traffic block that got extended to the main roads, increasing pollution there,” says Zahid H Javali, Editor of Residents Watch, a HSR Layout neighbourhood publication. Javali says that the community should be taken on board before such initiatives are organised. Vidya from Mumbai says that these events can have had a larger impact only when adequate alternatives to private transport exist. “An event cannot change mindsets in Mumbai. People just had fun during Equal Streets event and left. If public transport is not good enough and is time-consuming, people will continue to take cabs or cars,” she says. In Connaught Place in Delhi, which has hosted Raahgiri Days for long, traders are not yet ready for full pedestrianisation. NDMC is still negotiating with traders, says Amit Bhatt. “The bigger retail brands here say that their customers come in cars. But pedestrianisation of the area was one of the conditions when funds were allocated for its redevelopment in 2006-07,” he says. While many cities have initiated NMT infrastructure or pedestrianisation, the momentum has been slow. According to Bhatt, currently there are only two major roads in India that have been fully pedestrianised and sustained it – Mall Road in Shimla and MG Marg in Gangtok. “This is because of the local specificity here. These are both tourist spots with shopping areas, so both tourists and local shopkeepers benefit from pedestrianisation. Other cities like Vizag have attempted partial pedestrianisation of roads, but they are unable to sustain it since motorists are unwilling to walk even a mere hundred metres. How persistent the administration is, also matters,” he says. In the case of Mall Road, for example, pedestrianisation is backed by law; The Shimla Road Users and Pedestrians (Public Safety and Convenience) Act, 2007, makes a few roads fully or partly pedestrian. A few years back, Himachal Pradesh High Court also ordered that relaxation given to vehicle users in these roads should be stopped. Overall, the momentum for NMT is higher in smaller cities now. “These cities lack the technical expertise that metros have in terms of planners and engineers, but are leading the way. In metros, having a single, unified agency to coordinate transport is important; currently different agencies do different things,” he says. When it comes to opposition from motorists to NMT projects, Bhatt believes that the government has to take a stand. “In India, the highest proportion of car users are in Delhi – only 13%. So governments have to decide if transport policies should benefit the majority or the minority,” he says. 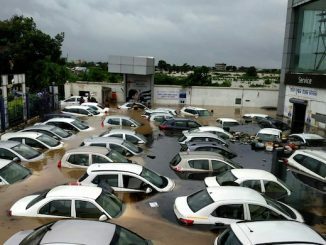 As in many other cities in India, extreme weather events such as heavy rainfall and intolerable temperatures are becoming an annual event in Bhubaneswar too. One can no longer ignore the urgent need for climate-smart urban planning. When do you become an insider in your city? Do you really belong in the city where you live? What makes one a true Bengalurean, or a true Mumbaikar? In a journey across global cities, Jahnavi Jayanth finds that often the attitudes and factors that thwart inclusiveness are innate and similar.